A new study, which was conducted across the UK last August on behalf of Bic, has shown a major declining interest in writing amongst teenagers. Almost half (49%) of 13-19 year olds have never written a thank you letter, 83% have never written a love letter and a quarter (26%) have never even written a birthday or Christmas card! I honestly can't believe that 26% of teenagers have never written a birthday or Christmas card!? I get it that yes maybe parents tend to write thank you cards on their behalf and it's not really massively popular to write a love letter any more however come on! Surely writing a birthday card or Christmas card was drummed into you from primary school age? Heck I even loved writing postcards! Maybe I'm just getting old. I think a lot of it will be to do with all the technology floating around these days. Why put pen to paper when you can text or facebook message, whatsapp or tweet etc. There's a problem with this though with nearly 7 in 10 (67%) admit texting and instant messages are detrimental to their writing, with 21% admitting it makes their spelling worse. I've seen some of the way people use short hand to text or message with and honestly it annoys me. I know its quicker but typing out the word is so much better plus you learn new words and of course better spelling. Anyway I digress. What's really a shame is that many believe that handwritten letters and notes are more personal and heartfelt however people still choose to communicate via an electronic method. I know that when I have to do thank you cards I personally hand write them so it looks like I have put more thought and effort in. Two thirds (58%) say receiving a handwritten letter would mean much more to them than an electronic equivalent, 65% confess that any relative receiving a handwritten note from them would probably be delighted as they'd consider it more thoughtful. Bic UK & ROI started this campaign to get young people, and all ages really, back into the swing of writing. It's a dying art and it would be a shame to lose it. 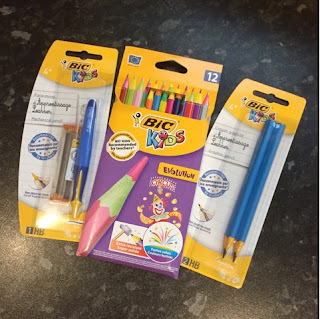 Bic were kind enough to send us some of their kids range to help get Logan into writing. 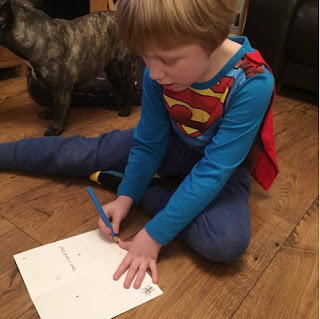 I have to confess that Logan isn't a massive fan of writing due to his autism but it is an important life skill and he has to learn it if he likes it or not unfortunately. Luckily the pencils we received from Bic are amazing and perfectly designed for little hands. Logan is especially fond of the Crayon Graphite pencil as it's thicker and shaped to fit into smaller hands. He's been using this pencil quite a bit recently to write birthday cards for his friends and also when doing his homework. 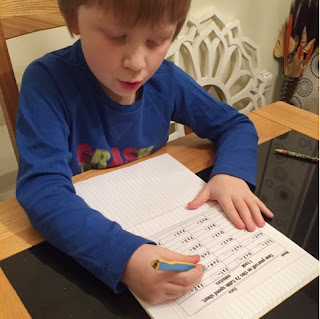 Homework has always been a struggle for him and these pencils have given him a little boost which is great. I'd definitely recommend them if your child has sensory grip issues or if they're struggling to hold a thinner pencil. I'll definitely be encouraging Logan to continue writing to the best of his ability and although he's a mad gadget fan there'll be plenty of opportunities for him to practice his writing. As you might know we're heading to Legoland soon so I'm sure a few of his friends will be receiving some handwritten postcards. 0 comments on "#JustWrite with Bic"